I had heard of The RuMa Hotel and Residences from mummy’s friend, Monica Lai of Ireka Corporation: the hotel’s developers who enjoy a track record of building award-winning hotels in Kuala Lumpur. So when the opportunity for a staycation arose, I nipped over in my idea of “casual luggage for a casual stay” - just one carry-on (Louis Vuitton Pégase Légèr 55), one overnight bag (Louis Vuitton Keepall Bandouliere 50) and one handbag (Hermes Kelly in box calf leather, 32cm) in the back of my car (an SUV I dub ‘Jumbo’). As I stepped out of the Birdcage - the connecting antechamber - and over the threshold into reception, my first impression was that I had entered a transcendent space. 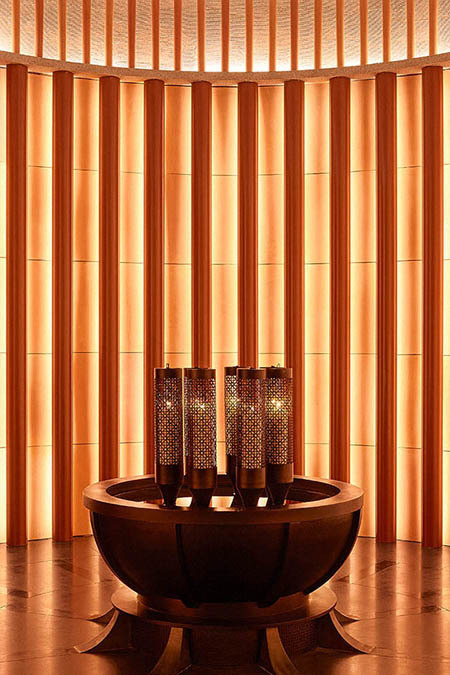 The vast space was bathed in warm tones, lit by spotlights and pillars, further enhanced by a copper ceiling that seemed to glow from within. Large black tiles gave the impression of a fathomless floor while the reflection of the lights added to the feeling of weightlessness. A grand double wrought-iron staircase flanked a dramatically-lit golden gown, which upon closer inspection was revealed to be a kebaya - a traditional Malay dress - clad in gold butterflies, a creation by Malaysia’s “King of Fashion” Dato Bernard Chandran (below, left). I learnt that the lobby design - the vision of Andy Hall of MQ Studios - was inspired by Malaysia’s tin-mining industry: from the copper ceiling to the grand staircase (left) and chandeliers shaped like oil drills (below, right). I made myself comfortable on one of the sofas with a refreshing towel and welcome drink (left) that, if my memory serves me well, was assam boi while the check-in process was handled just out of sight, efficiently and discreetly. With a moment to myself and a chance to soak up the ambience, I felt a vague sense of deja vu. I was reminded of the description of the Shanghai home of Colette Bing, the fictional daughter of one of China’s richest men in China Rich Girlfriend, the 2nd novel in the Crazy Rich Asians trilogy. In the novel, Colette’s home’s grand reception was modelled after The PuLi Shanghai. My inklings were not completely unfounded. 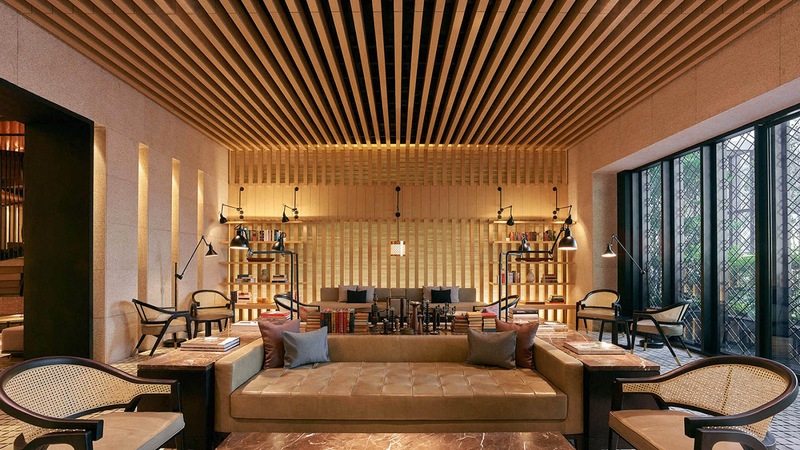 The RuMa Hotel and Residences is one of the 4 properties that belong to Shanghai-based Urban Resort Concepts (URC), whose first hotel is The PuLi. Visually, the similarities ended there. Each of URC’s hotels’ design are unique to their location. There are two recurring themes within the hotel design. 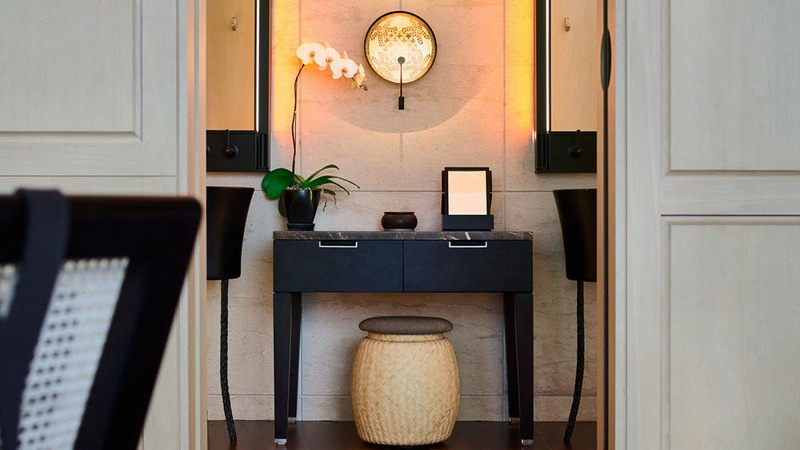 The first is a contemporary interpretation of Malaysia’s colonial past, reflected in the natural Malaysian elements throughout the hotel: rattan weaves in the handmade furniture and lattice screens inspired by patterns of kain pelikat (sarong), to name just two. The 2nd theme is driven by the name of the hotel itself: RuMa is a play on the Malaysian word “rumah” which means house or home. The literal manifestation of which greets guests at the hotel entrance on street level: entrance pillars taken from an actual house in Terengganu, North Malaysia (below). The “best of Malaysian arts and crafts” aesthetic is clearer in daylight. Head up to the SANTAI Pool Bar and Lounge to appreciate the intricacies of traditional Malaysian weaving techniques and materials, as evident in the furnishings and decor. If the sultry stylings of the SEVEN Lobby Bar and Lounge - on the opposite end of the same floor as the reception - is too incandescent for one’s taste, a cocktail by the pool with a view of the Petronas Twin Towers is a fresh, sun-soaked, and airy contrast. But I digress. The reason why I was drawn to The RuMa was their promise of “Hostmanship”. The word, coined by parent group Urban Resort Concepts, encapsulates the unique service culture that is practiced in all their hotels. Hostmanship means the guests always come first, even at the expense of the hotel. The most obvious example being the extremely flexible 24 hour check-in and check-out times. That’s right. Even if one arrives off a red-eye flight at the crack of dawn, as long as one notifies The RuMa 24 hours prior, one can check-in right away - even from the comfort of their own room*. Hostmanship means cutting out the nitty gritty processes that are not beneficial to guests, such as charging for minibar items. You’re not here to worry about hidden charges, you’re here to have a relaxing stay. Hostmanship takes the guest experience both to a higher level as well as back to its original intent: to make the guest experience as intuitive, engaging and as human as possible. *Was this why, despite the hotel being almost fully occupied, there was an uncluttered feel? There were people coming and going (including a well-known socialite there for a photoshoot with her team) and yet the ambience of the hotel still walked the fine line between buzzing and hectic. Aside from minibar charges (so passe and petty, if you ask me), more unneccesary details were done away with. Such as a business centre. Frankly, in this day and age of digital itineraries printing is outdated and terrible for the environment too. Even so, anything one would print at a hotel’s business centre, the Concierge will do for free. That said, The RuMa is hardly lacking for facilities. There’s Librari* (above), the reading room. There are meeting rooms for corporate or social events: Bilik** I & Bilik II, ideal for private dining events and Bilik III, a fully equipped boardroom perfect for business meetings. There’s The Pavilion pre-function and meeting room with kitchen and the Board Room; and for more lively occassions, the SANTAI Pool Bar and Lounge on the 6th floor. *yes, “librari” is the Malay word for library. What a wildly imaginative language, I know. “Bilik” is Malay for room. The biggest draw, which is a destination in its own right is ATAS Modern Malaysian Eatery. I had an elevated dining experience at ATAS (the Malay word for upstairs, above), where authentic Malaysian flavours were showcased in unexpected ways on Western ingredients. And I don’t mean in a condescending “chicken rendang should be crispy!” way *clutches pearls*. Executive Chef Tyson Gee shows reverence for Malaysian flavours, using it to elevate Western dishes. Think sambal assam and kai lan (a local vegetable) used to improve wagyu tenderloin (right). Now we’re talking. The moment I reached my Corner Studio I kicked off my Roger Viviers and took in my home for the night. 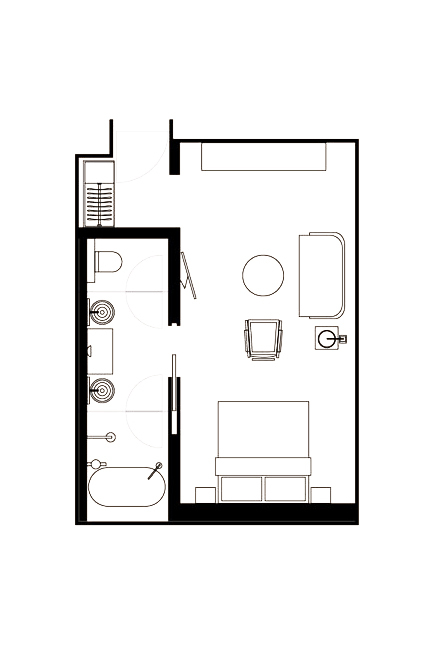 A 45 m² corner room is generous (already half the size of my apartment in London! ), but the intelligent layout and abundance of light made even better use of the space. The entire length of one wall was ceiling-to-nearly-floor windows with a view of the city, drenching the Corner Studio with natural light by day and by night, making for a neon vision of Kuala Lumpur’s skyline. A versatile living area performed triple duty: as a workspace for my home office du jour, a dining area for my dinner (I ordered a charcoal bun burger off the room service menu, it was fabulous), and an entertainment area (thank you Netflix for picking up Rupaul’s Drag Race Season 11). A sliding floor-to-ceiling door, so well-concealed, revealed a bathroom with double sinks, a tub, and a rainforest shower. The colonial-meets-contemporary style of the Corner Studio continued to highlight local elements: the woven headboard, handmade lounger chairs, traditional bowls upcycled as wall sconces in the bathrooms, even the subtle lattice detail on the lighting panels that flank the bathroom mirrors (which, by the way, could be flipped to create two different modes of lighting). Happily, both function as well as form enjoy the same attention to detail, be it the amenities provided or the service. Terry towels so thick and fluffy, one could make a winter coat out of them. Room slippers in a waffled weave that provided a pleasing, contrasting crisp texture to the soft, well-padded sole. The complimentary minibar I made such a big deal of was fully-stocked, no paltry offerings here: a jar full of rose and pistachio nougat, a bowl of fresh local fruit, more jars of biscuits and nuts, beer; small-batch, artisanal, local soft drinks as well as more mainstream offerings such as Coca-Cola, six 500ml bottles of still water (2 of which were in the fridge), a tea set, and Nespresso capsules among others. The Nespresso machine provided happened to be the same make as the one I own, which was a nice coincidence. Concept and aesthetic, check. Facilities and amenities, check. Rooms and service, check. Finally, location. The RuMa is situated on Jalan Kia Peng, right in the middle of all the action of the city. With the Golden Triangle on one side and KLCC on the other - accessible via a short walk through an indoor, air-conditioned passage in Kuala Lumpur Convention Centre, which itself is a 3 minute walk from The RuMa - the location is as central as they come. I could’ve done the usually-impossible: visit KLCC without having to worry about traffic or parking. But honestly I never wanted to leave the property: such is the allure of The RuMa’s Hostmanship.